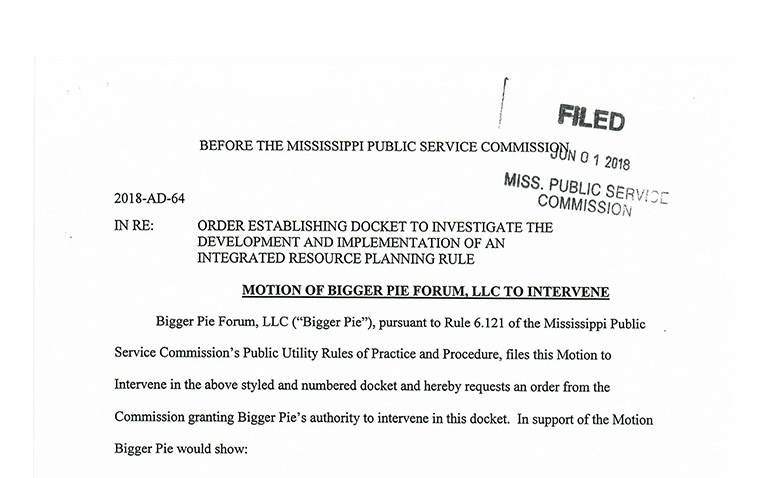 Bigger Pie Forum was granted intervention in an order by the PSC on Friday regarding a docket with the Mississippi Public Service Commission that will decide how the commission reviews the future generation needs and capacity of the state’s two investor-owned utilities, Mississippi Power and Entergy. BPF was the voice of dissent back when Kemper was being promoted by many in the state and federal government to be a cheap, reliable way to provide electricity for the utility’s 186,000 customers in 23 south Mississippi counties. Bigger Pie warned ratepayers and policymakers that the plant would never cost as little as original estimates stated and would result in double-digit rate increases to help pay for Kemper’s ever-escalating costs. BPF took legal action all the way to the Supreme Court of Mississippi to secure the natural gas price forecasts that the company wanted to keep confidential. These forecasts were heavily skewed toward justifying Mississippi Power’s case for Kemper and making the $7.5 billion plant a better value than it turned out be. Events such as the utility shutting down the plant’s problem-plagued gasifiers and the commission reaching a settlement with the utility to run the plant only as a natural gas plant have justified BPF’s multi-year criticism of Kemper and its promoters. In this new docket, the PSC will receive input from the utilities and other stakeholders such as BPF on how to write procedures on reviewing each utility’s possible future generation needs and the most reliable and cheapest way to satisfy those needs. Reliable, inexpensive electricity is key to economic growth and we are dedicated to promoting bottom-up solutions to growing the state’s economy. This docket will be critical to determining how the PSC builds a new framework for oversight. It is BPF’s opinion that the PSC and Mississippi would benefit from a full time Consumer Advocate to represent the interests of citizens across the state and it is our goal to continue promoting the creation of a Consumer Advocate through legislative or regulatory process.